The Fishers Finery Ponte Pull On Boot Leg Pant is your new go-to every day piece. This pant will take you from day to night. Wear it to work then out to a date, a function or event. Our comfortable Ponte Roma fabric blend of 45% Bamboo Viscose, 20% Organic Cotton, 27% Polyester and 8% Spandex is super soft and supportive. There are no zippers and no buttons to fuss with, just pull on and go! Our work pant has a wide waistband, faux front fly and belt loops that give the illusion of a work pant while still having the comfort of a yoga pant. Faux front and back pockets add to a clean and elevated look without the hassle of bulky pocket bags. Our pant is fitted at the hip and thigh. It is mid-rise and has a classic boot leg opening. 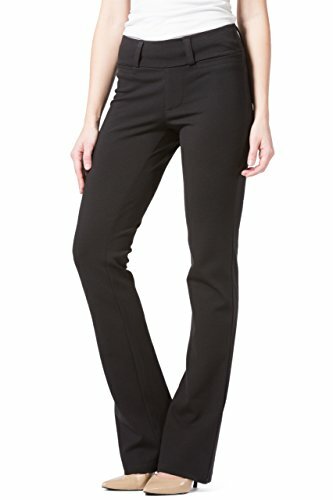 We've taken all the benefits of a yoga pant and added the style of a work pant! HIGH-QUALITY DESIGN: This Stretch Pull On Pant has a wide waistband, faux front fly, faux front and back pockets, back darts and belt loops. We've taken the benefits of a yoga pant and added the style of a work pant! VARIETY OF COLORS AND SIZES: Choose from Black, Navy, Sky Gray and Khaki. Sizes range from X-Small to X-Large and inseams of Petite (29"), Regular (32") and Tall (35"). EASY CARE INSTRUCTIONS: Our Ponte Stretch Pant is machine washable. Wash in cold water on the delicate cycle. Tumble dry low.